Are you ready for some off-road adventure in Costa Rica? Get ready for some exciting off-road action in Tamarindo, the town that never rests! Grab a helmet, rev up your ATV and join us on one of our Tamarindo ATV tours! Choose from a short ATV excursion in Tamarindo hills, a longer ride out to Avellanas Beach, or explore the coastal trails all the way out to Conchal and Pirate Bay. Or add a little zip to your ATV tour by making it an ATV & Canopy combo tour. We also offer full day excursions to some of Costa Rica's most famous Adventure Parks for a full day of off-road fun. Regardles of the off-road adventure you choose, all of our Tamarindo ATV tours will bring you to amazing vantage points, so don't forget your cameras! 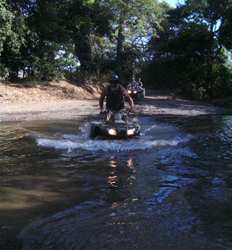 The Real Deal tours offers the best ATV tours in Tamarindo and at the best prices. Below we have a list of ATV and Off-roads tours available for you in the Tamarindo region. So rev em up and head to the hills on one of our Tamarindo ATV & Off-Road tours in Costa Rica! Just land in Tamarindo and looking to explore the area a bit more? 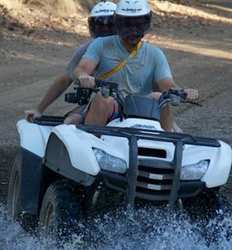 Our Tamarindo ATV Express is the perfect ATV tour in Tamarindo for you. 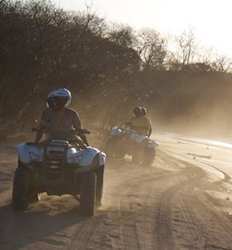 Our expert guides will take you to explore the dusty (or muddy) back roads and off-road trails of Tamarindo by ATV. Just one hour exploring Tamarindo on your own ATV and you will feel like a local! Even if you are not an avid surfer, a trip to Avellanas beach is a must when visiting Tamarindo. Since the only access is via a bumpy road through the jungle full of hazards, we cannot think of a better way to access Playa Avellanas than on your own ATV. Join our Avellanas ATV Tour and experience the off-road thrill for yourself! Avellanas Beach ATV Tour deposit is $15.00 per Single ATV and $20.00 per Double ATV. Looking for some offroad action on your Costa Rica vacation? 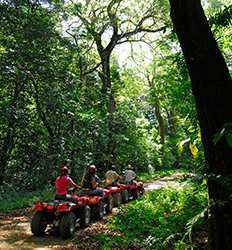 Our Conchal & Pirates Bay ATV tour in Tamarindo is just what you are looking for! Explore the dry forest jungle trails, the country roads, coastal treks and maybe splash around a bit too all the way to Conchal on this 3 hour ATV excursion in Tamarindo! Your offroad adventure begins here! Conchal & Pirates Bay ATV Tour deposit is $19.00 per Single ATV and $24.00 per Double ATV. Who knew you could pack in so much adrenaline pumping fun in just 3 hours? 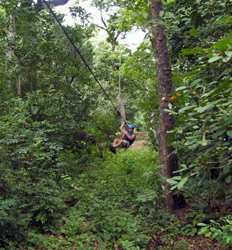 Well our Tamarindo ATV + Canopy tour is the perfect way to get to know Tamarindo Beach and the dry forest mountains surrounding it. 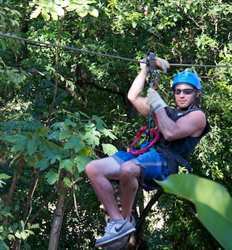 ATV Express + Canopy Tour = Perfect day in Tamarindo! Combine two of Tamarindo’s best tours and what do you get? Our awesome Avellanas Beach ATV + Canopy tour, that’s what!! For an incredible half day of adrenaline packed fun, join our local guides off-road through all the best Tamarindo has to offer. 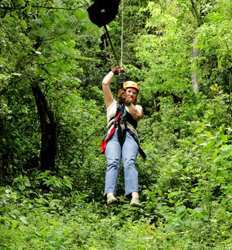 Tamarindo ATV tour + Tamarindo Canopy Tour....you really cannot go wrong there so get to booking already! Avellanas Beach ATV + Canopy Tour deposit is $22.00 per Single ATV and $27.00 per Double ATV. Looking for action? Our Conchal & Pirates Bay ATV + Canopy Tour in Tamarindo is an action packed day of adventure in Costa Rica you should not miss out on. Combine your Conchal ATV tour with an amazing canopy tour in Tamarindo and you have a full day of adrenaline pumping fun in the sun! 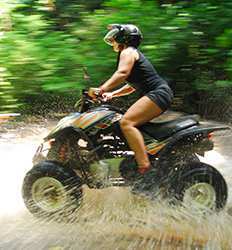 Conchal & Pirates Bay ATV + Canopy Tour deposit is $26.00 per person per Single ATV and $31.00 per person per Double ATV. Looking for a rugged forest adventure with a relaxing and mellow end? Look no further than our Borinquen Mountiain ATV & Hot Springs tour! 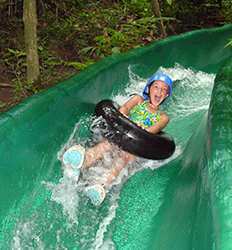 It´s everything you´re looking for, packed into one fun-filled day at the Borinquen Mountain Resort!